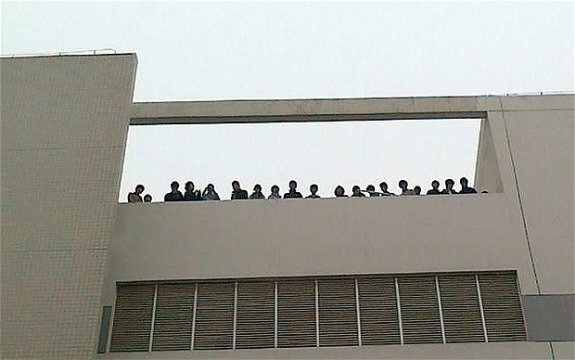 Telegraph reports around 150 workers at Foxconn's three-floor plant in Wuhan threatened to commit suicide by jumping from the factory's roof in a protest at their working conditions. The protest was resolved successfully and peacefully after discussions between the workers, local Foxconn staff and local government officials. The workers were eventually coaxed down after two days on top of their three-floor plant in Wuhan by Foxconn managers and local Chinese Communist party officials. The latest protest began on January 2 after managers decided to move around 600 workers to a new production line, making computer cases for Acer, a Taiwanese computer company. "We were put to work without any training, and paid piecemeal," said one of the protesting workers, who asked not to be named. "The assembly line ran very fast and after just one morning we all had blisters and the skin on our hand was black. The factory was also really choked with dust and no one could bear it," he said. Several reports from inside Foxconn factories have suggested that while the company is more advanced than many of its competitors, it is run in a "military" fashion that many workers cannot cope with. At Foxconn's flagship plant in Longhua, five per cent of its workers, or 24,000 people, quit every month.